Home › Home News › Hello from the women of Pitumarca, Peru! 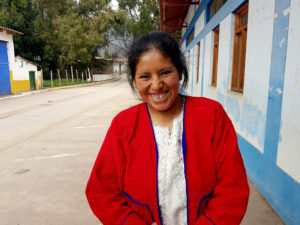 Sophie Jenkins, MMI’s International Program officer, recently met with the women of the Puka Phallcha association in Pitumarca, Peru, including Lourdes, aged 27, who was recently elected as president of the association. Together with her colleagues, Lourdes has participated in a range of training workshops through MMI’s Women’s Livelihoods Project focusing not just on skills for income generation, but also citizenship, human rights and leadership workshops to ensure their voices can be heard in their community. The women told Sophie how proud they were of their achievements, with one group member leaving their meeting early to be sworn in as a local community leader!